Excellent reproduction of the automatic transmission kick-down linkage bell crank pivot assembly used on all 1966-67 big blocks, 1967-69 big block A-Body, and all 426 hemi applications. Formed with all of the details of an original part and clear zinc plated for proper appearance. For use with the larger 5/16” rod end. Includes pivot pin, flat washer, and retaining pin. Reference Chrysler part numbers 2536 266, 2658 286, 6027 983, and 120 394. Excellent reproduction of the automatic transmission kick-down linkage bell crank pivot assembly used on all 1968-70 big block B & E-Body applications. Formed with all of the details of an original part and clear zinc plated for proper appearance. For use with the smaller 1/4” rod end. Includes pivot pin, flat washer, and retaining pin. Reference Chrysler part numbers 2843 794, 2658 286, 6027 983, and 120 394. 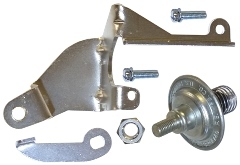 Excellent reproduction of the automatic transmission kick-down linkage bell crank pivot assembly used on all 1968-73 340 A-Body and 1970 340 4-barrel E-Body applications. Formed with all of the details of an original part and clear zinc plated for proper appearance. Includes pivot pin, flat washer, and retaining pin. Reference Chrysler part numbers 2863 718, 2658 286, 6027 983, and 120 394. 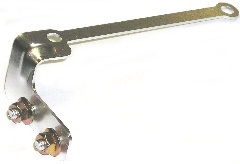 An excellent reproduction of the throttle kickdown lever for automatic transmission linkage used on 1966-70 B-Body Big Block, 1967-70 B-Body Small Block, 1970 E-Body Big Block and 318 2-barrel, 1965-68 C-Body Big Block, and 1967-68 C-Body Small Block applications. Zinc plated and includes the correct washer and hairpin clip. Reference Chrysler part number 2465 413. 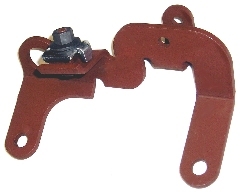 An excellent reproduction of the throttle kickdown lever for automatic transmission linkage used on 1967-69 A-Body Big Block applications. Zinc plated and includes the correct washer and hairpin clip. Reference Chrysler part number 2863 725. 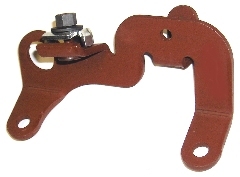 An excellent reproduction of the throttle kickdown lever for automatic transmission linkage used on 1966-67 426 Hemi applications. Zinc plated and includes the correct washer and hairpin clip. Reference Chrysler part number 2780 592. 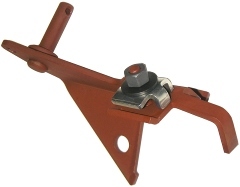 An excellent reproduction of the throttle kickdown lever for automatic transmission linkage used on 1967-76 2-barrel & 1968-76 4-barrel A-Body Small Block, 1970-71 E-Body 340 4-barrel, and 1971 B-Body 340 4-barrel applications. Zinc plated and includes the correct washer and hairpin clip. Reference Chrysler part number 2780 835. 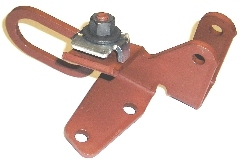 An excellent reproduction of the throttle kickdown lever for automatic transmission linkage used on 1968-71 426 Hemi applications. 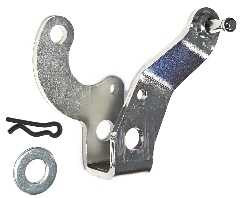 Zinc plated and includes the correct washer and hairpin clip. Reference Chrysler part number 2899 334. 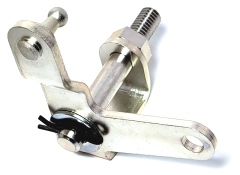 An excellent reproduction of the automatic transmission kickdown rod connector used on all 1965-66 B and C-Body applications, as well as all 1966-71 426 hemi applications. Fabricated from the correct gauge steel, silver soldered together, and silver cadmium plated for original appearance. Return spring hole is properly chamfered and tube is threaded in 5/16-24UNF. Reference Chrysler part number 2468 744. 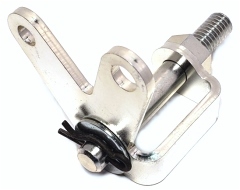 An excellent reproduction of the retaining clip used to secure the throttle cable to the firewall on all 1967 and later cars with the round throttle cable housing. Stamped from the correct gauge spring steel and zinc phosphate and oiled as original. Reference Chrysler part number 6027 155. 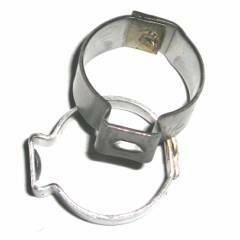 An excellent reproduction of the retaining clip used to secure the throttle cable to the firewall on all E-Body and 1971-74 B-body cars. Formed from the correct gauge steel, this clip is bent over after inserting through the throttle cable mounting barb. Two clips should be used on original cables to prevent weak or stiff cable barbs from backing away from the firewall. Reference Chrysler part number 3462 725. Some parts not made in the USA. 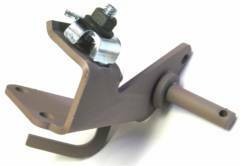 Excellent reproductions of the front and rear throttle rods used on all 340 and 440 Six Pack and Six Barrel applications. These rods connect the center carburetor to the front and rear carburetors and are not included when you purchase a new set of carbs. Correct tapered design as original and finished in “light” yellow zinc dichromate. 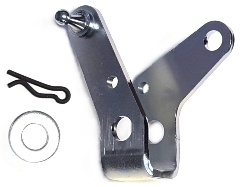 Includes both the LH and RH throttle rod clips to connect to each carburetor. Great for that restoration and a must for a new installation. Reference Chrysler part numbers 2951 486 and 2951 487. 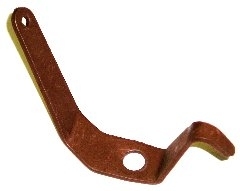 An excellent reproduction of the carburetor interconnecting rod swivel used on all 1966-71 426 hemi rear carburetor applications. Cadmium plated as original and includes correct zinc phosphate hex coni SEMS nut. Reference Chrysler part number 2899 329. 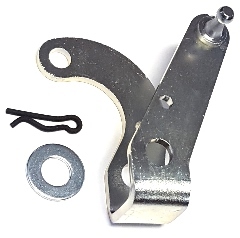 An excellent reproduction of the carburetor interconnecting rod swivel used on all 1966-71 426 hemi front carburetor applications. Cadmium plated as original and includes correct zinc phosphate hex coni SEMS nut. Reference Chrysler part number 2899 396. An excellent reproduction of the carburetor linkage stud used on all 1967 through early 1969 4-barrel 4-speed applications. 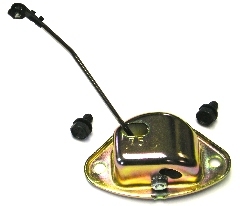 Cadmium plated as original and includes correct throttle cable retaining pin. Reference Chrysler part number 2806 440. An excellent reproduction of the carburetor linkage stud used on 1966-69 426 Hemi and 1966 4-barrel applications. Used for both manual and automatic transmissions. Cadmium plated as original and includes correct throttle cable retaining pin, cadmium plated washer, and hair pin cotter. Most common variant of this part. Also found in zinc phosphate finish as supplied with part #743-PH. Reference Chrysler part number 2468 743. An excellent reproduction of the carburetor linkage stud used on 1966-69 426 Hemi and 1966 4-barrel applications. Used for both manual and automatic transmissions. Zinc phosphate plated as original and includes correct throttle cable retaining pin, cadmium plated washer, and hair pin cotter. 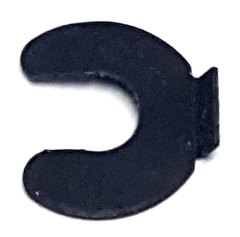 Less common variant of this part. Also found in cadmium finish as supplied with part #743-C. Reference Chrysler part number 2468 743. An excellent reproduction of the carburetor linkage stud used on 1969 1/2 "A12" 440 Six Pack applications. Used for both manual and automatic transmissions. Cadmium plated as original and includes correct throttle cable retaining pin, cadmium plated washer, and hair pin cotter. Reference Chrysler part number 2951 485. An excellent reproduction of the carburetor linkage stud used on 1970-71 440 Six Pack and 1971-73 340 4-barrel applications. Used for both manual and automatic transmissions. Zinc phosphate plated as original and includes correct throttle cable retaining pin, cadmium plated washer, and hair pin cotter. Reference Chrysler part number 2951 485. An excellent reproduction of the carburetor linkage stud used on all late 1969-74 4-barrel 4-speed applications EXCEPT 1971-73 340 4-barrel. Zinc phosphate plated as original and includes correct throttle cable retaining pin. Reference Chrysler part number 3418 899. 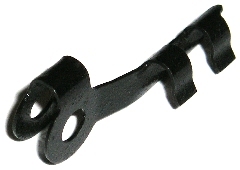 An excellent reproduction of the carburetor linkage stud used on all late 1969-74 4-barrel automatic transmission applications EXCEPT 1971-73 340 4-barrel. Also used on 1970 340 Six Pack applications with both manual and automatic transmissions. Zinc phosphate plated as original and includes correct throttle cable retaining pin, cadmium plated washer, and hair pin cotter. Reference Chrysler part number 3418 900. 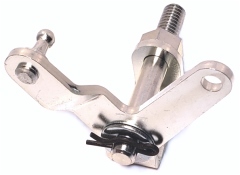 An excellent reproduction of the carburetor linkage stud used on 1970-71 426 Hemi applications. Used for both manual and automatic transmissions. Cadmium plated as original and includes correct throttle cable retaining pins and cadmium plated washer for automatic applications. Reference Chrysler part number 3462 701. Concours quality reproduction of the carburetor linkage stud nut used on all 1966-Early 1970 applications. Features include correct conical spin washer, recessed thread end, and zinc phosphate plated & oiled as original. Reference Chrysler part number 120376. 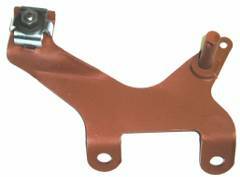 Part #376 is used with HWC carburetor linkage studs part #440, #441, #743-C, #743-PH, #485-A12, and early model year applications of part #485, #701, #899, & #900. 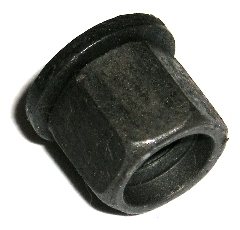 Concours quality reproduction of the carburetor linkage stud nut used on all Mid-1970 and later applications. Features include formed flange washer, special locking patch, and zinc phosphate plated & oiled as original. Reference Chrysler part number 6028 699. 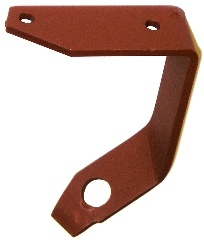 Part #699 is used with mid-1970 and later applications of HWC carburetor linkage studs part #485, #701, #899, and #900. 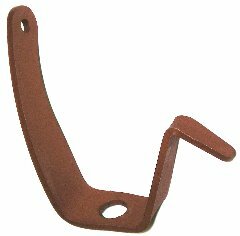 An excellent reproduction of the 1/8” choke rod clip used to secure the thermostatic choke rod to the air valve lever on all MoPar applications. Used on 2- and 4-barrel Carter and Holley carburetors, including Six Pack. Not used on Hemi applications. 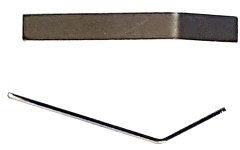 Stamped from correct gauge spring steel material and finished in black oxide and oiled. Replaces Chrysler part number 2465 560 that is no longer available. Excellent reproduction made to exacting standards, features correct lettering, and is injection molded from ultra-high temperature material. Replace that broken or missing part today! NOTE: This part also fits 1958-62 dual four barrel applications, as well as dealer installed dual fours from 1963-65. Both the heat tube cover and piston housing cover are made to exacting standards, feature correct lettering, etched index mark, and are injection molded from ultra-high temperature material. 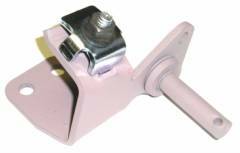 Correct zinc dichromate housing retainer and mounting screws finish off the package. Kit #6847 can be installed on any Carter AFB piston housing to create a functional choke for your HEMI. This kit contains the parts shown below (R to L): choke baffle plate, housing gasket, choke coil plate assembly, piston housing cover, heat tube cover gasket, heat tube cover, housing retainer, and three correct retainer screws. NOTE: These choke parts also fit 1958-62 dual four barrel applications, as well as dealer installed dual fours from 1963-65. Zinc dichromate housing retainer, stainless choke baffle plate, housing gasket, heat tube cover gasket, and correct mounting screws finish off the package. The most complete package available! Awesome reproduction of the long extinct 2863 845 choke assembly for 1968-69 383/440 and 1968-70 340 Carter AVS equipped cars. Has the correct part number "45" stamped on the choke housing. "Lean" and "Rich" marks for adjustment. Yellow zinc dichromate and zinc finished parts as original. 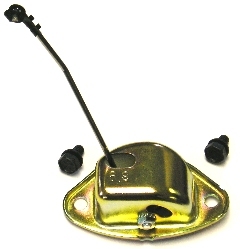 Includes carburetor attaching clip and correct mounting screw. Awesome reproduction of the long extinct 2951 653 choke assembly for 1970-71 383/440 and 1971 440 Carter AVS equipped cars. Has the correct part number "53" stamped on the choke housing. Yellow zinc dichromate and zinc finished parts as original. 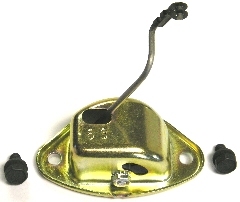 Includes carburetor attaching clip and two correct mounting screws. Faithfully reproduced with the stiffening boss and real cadmium plating. Comes complete with zinc dichromate coni keps nuts with the same dimensions as originals. Bolts on top of front carburetor base using rear two mounting bolts. A must for the AAR or T/A restoration! Reference Chrysler part number 2402 249. Reference Chrysler part number 2536 835. Reference Chrysler part number 2806 452. Reference Chrysler part number 2806 451. Bolts to rear A/C compressor bracket with 1/4-20 hex head bolt. Zinc plated as original. Reference Chrysler part number 3899 962. Reference Chrysler part number 2951 484. Reference Chrysler part number 3418 835. Reference Chrysler part number 2806 465. Reference Chrysler part number 2863 711. Reference Chrysler part number 3577 508. 1971-73 340 & 360 4-Barrel Applications. Used through April 1973. Reference Chrysler part number 3462 736. Reference Chrysler part numbers 2780 586 and 2780 587. Correct 33 coil red Small Block 4-barrel throttle return spring. Powder coated for a lasting appearance. Correct 22 coil green with blue stripe front and 18 coil red with white stripe rear throttle return springs for the 426 Hemi dual AFB arrangement. Also included is the correct 19 coil black automatic transmission kick-down return spring. Powder coated for a lasting appearance. 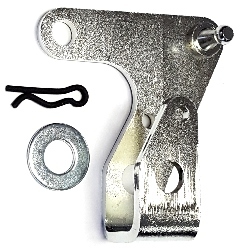 1967-70 383 4-barrel throttle cable mounting bracket complete with zinc plated hold down and correct hex coni keps nut. Correct for A & B-Body applications. Will also fit earlier engines but is not exact replica of the 1966 version part. Use for both 4-speed and automatic transmission applications. Remove pivot pin and spacer for use with 4-speed. Reference Chrysler part number 2863 703 for automatic and 2863 704 4-speed version. 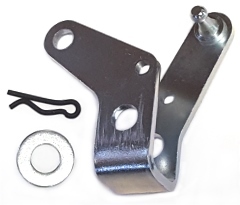 1967-70 440 4-barrel throttle cable mounting bracket complete with zinc plated hold down and correct hex coni keps nut. Correct for A & B-Body applications. Will also fit earlier engines but is not exact replica of the 1966 version part. Use for both 4-speed and automatic transmission applications. Remove pivot pin and spacer for use with 4-speed. Reference Chrysler part number 2780 876. 1969 1/2-70 440 Six Pack Throttle Cable Mounting Bracket complete with zinc plated hold down and correct hex coni keps nut. Use for both 4-speed and automatic transmission applications. Remove pivot pin and spacer for use with 4-speed. Reference Chrysler part number 3418 840. 1971 440 Six Pack Throttle Cable Mounting Bracket complete with zinc plated hold down and correct hex coni keps nut. Use for both 4-speed and automatic transmission applications. Reference Chrysler part number 3462 705. 1971 383 Four-Barrel Throttle Cable Mounting Bracket complete with zinc plated hold down and correct hex coni keps nut. Used on B, C, and E-Body applications. Use for both 4-speed and automatic transmission applications. Reference Chrysler part number 3418 824. 1971-72 440 Four-Barrel B-Body and 1970 440 C-Body Throttle Cable Mounting Bracket complete with zinc plated hold down and correct hex coni keps nut. Use for both 4-speed and automatic transmission applications. Reference Chrysler part number 3418 826. 1968-73 340 Four-Barrel Throttle Cable Mounting Bracket complete with zinc plated hold down and correct hex coni keps nut. Used all years on A-Body and 1970-71 B & E-Body applications. Hole in pivot pin changed for 1970 and later applications, but will still function properly. 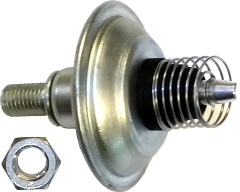 Use part #561 for 1972-74 B & E-Body applications. Use for both 4-speed and automatic transmission applications. Remove pivot pin and spacer for use with 4-speed. Reference Chrysler part number 2863 713 & 3462 741. 1972-73 340 Four-Barrel and 1974 360 Four-Barrel Throttle Cable Mounting Bracket complete with zinc plated hold down and correct hex coni keps nut. Used on B & E-Body applications only. Use part #0060 for A-Body applications. Use for both 4-speed and automatic transmission applications. Reference Chrysler part number 3577 561. 340 Six Pack Throttle Cable Mounting Bracket complete with zinc plated hold down and correct hex coni keps nut. Use for both 4-speed and automatic transmission applications. Reference Chrysler part number 3577 506. 1966-71 426 Hemi Throttle Cable Mounting Bracket complete with zinc plated hold down and correct hex coni keps nut. Use for both 4-speed and automatic transmission applications. Remove pivot pin and spacer for use with 4-speed. Reference Chrysler part number 2780 589. Used on all Chrysler engine applications and is no longer available from Chrysler. 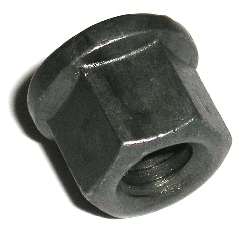 Correct bright zinc plated with correct phosphate coni keps nut. Reference Chrysler part numbers 2402 210 and 120 375. 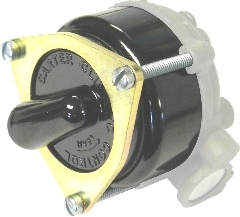 Air Cleaner to Carburetor stud for 1968-71 Carter AVS applications. Can be used on un-silenced, snorkel, and Air Grabber air cleaners. Phosphate finish with correctly formed thread lengths on each end. Air Cleaner to Carburetor stud for 1966-71 Carter AFB 426 Hemi applications. Also used on 1969 1/2 440 Six Pack lift off hood applications. Phosphate finish with correctly formed thread lengths on each end. 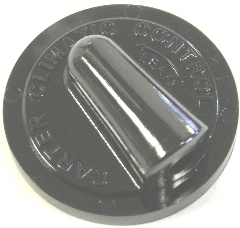 Air Cleaner to Carburetor stud for most Carter ThermoQuad applications. Phosphate finish with correctly formed thread lengths on each end. Air Cleaner to Carburetor stud for 1970-71 340 & 440 Holley Six Pack applications. Phosphate finish with correct length threads on each end. Used on all 1/4-20UNC air cleaner studs. Stamped from heavy gauge steel to duplicate original dimensions. Zinc plated for proper appearance and a lasting shine. An often rusted and decayed part in the trunk floor of your Challenger or Barracuda. Kit comes complete with OEM grommets, correct SEMS screws, and die cut closed-cell foam gasket. Replace yours today to give your trunk compartment the finishing touch. 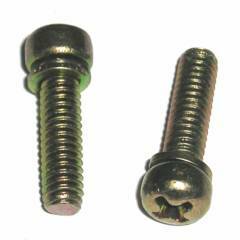 Correct length screws (4 long & 8 short) in the zinc dichromate finish as original. Includes 12 gaskets. New Holley carbs have hex head screws so replace them with correct style parts now! Correct 8-32 x 5/8" screws in zinc dichromate finish as original. Replace those dingy or missing screws with correct parts now! 6 screws required per carburetor. 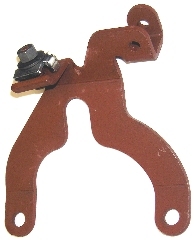 Correct Oetiker hose clamp used to connect rubber fuel lines to steel lines at fuel tank and at engine end near fuel pump.